A Bolton Birthday for You. 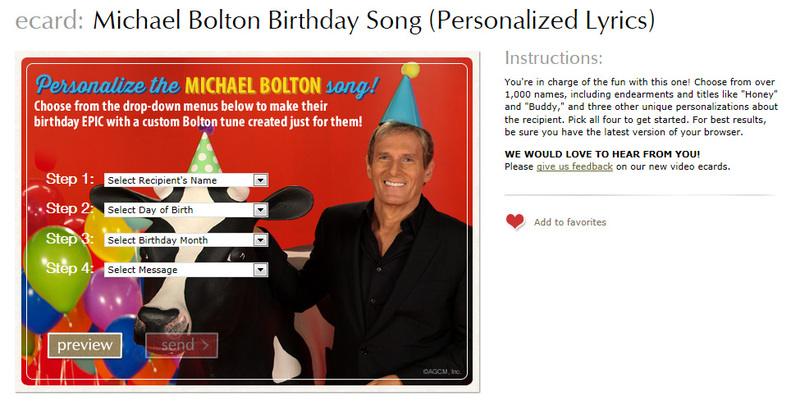 The greeting card company has created a customized birthday song where Bolton sings personalized lyrics drawing “over 1,000 pre-recorded names, including endearments and titles like ‘Honey’ and ‘Buddy,’” plus you select from one of 17 messages. How are we supposed to live without Bolton making a birthday cake, singing with a helium voice and crooning to a cow and chicken. Bolton is clearly willing to be silly (for quite a pay check one can bet). Uhm, I can think of a few things. Bet you can too.